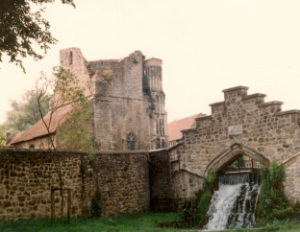 The Anglican Benedictine community of nuns that has made its home at Malling Abbey since 1916 was founded in 1891 as an active parish sisterhood. The sisters worked among the poor in Edmonton, North London until they became attracted to the Benedictine contemplative life through the preaching of Abbot Aelred Carlyle. In 1906 they moved to a farmhouse in Baltonsborough, a remote village in Somerset, to begin their enclosed monastic life under Benedictine vows. 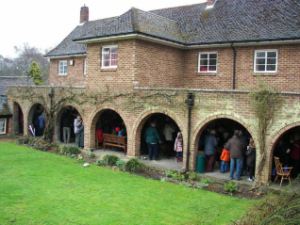 In 1916 the Trustees of Malling Abbey invited them to move to the more spacious and historic Abbey and to continue its tradition of Benedictine prayer, worship, work, study, and hospitality. This they have done for nearly a century, cherishing the Abbey’s heritage of peace and God-centred quiet, being stewards of this ‘place where prayer has been valid’ on behalf of the church and the world. The Pilsdon at Malling Community also make their home within the grounds of Malling Abbey. It is a Christian based Community with its ideals and ethos taken from the Pilsdon Community in Dorset. The first Pilsdon Community was founded in 1958 as a refuge for those in crisis. They seek to provide an environment where people can rebuild their lives after experiencing a crisis, whether sudden or progressive and offer a safe home for those working through depression, alcoholism, addiction, divorce or bereavement. Continuing this work in Pilsdon at Malling, the community welcome people to come and share our life, whether it is for a day, a week or many years. People who find themselves isolated and lonely on the fringe of society are particularly welcome.